It’s not natural, but like the curled tail of a sleeping dragon the fortified walls of Heraklion wrap and rise and descend around the city center. In the early 13th century, the Venetians conquered Crete from the Byzantine empire. The walls went up and became the city of Candia. It was in Candia that a Greek painter in the early 17th century left the island for Rome and other major Italian cities — eventually landing in Spain, where in Toledo he’d be known simply as El Greco. And then the Ottoman Empire took over the island. It was known as Megalokastro, literally “Large Fortification”. It was military rule over a militant island. Due to various uprisings the city developed a policy to close its vast gates each night. The Turks were locked in, and the Greeks locked out. Inside the city walls is the Metropolitan Cathedral of Agios Menas, the patron saint of the city. The Cretan author Nikos Kazantzakis — now buried at the highest point of the Venetians walls — depicts the two bell towers. One is named Freedom. The other is named Death. Before work in the morning, I lace up my running shoes. I apply sun screen to my nose and cheeks because the weather is now clear and hot. I start in a slow trot. My apartment is only a quarter mile from the city walls and just about every day I go jogging past and through all its displays. It becomes clear the city isn’t large at all, even when hoofing it. I like to start by going through the gates and up stone stairs to get on top of the wall. The entire western section of the wall is a park now, with trails for pedestrians and their puppies. Once I’m on top I go straight for the sea. The city to the right is Heraklion. Like a modern city it is made of apartments. But it still has its ruins. Some of them are Venetian. Some are hard to date. Half way to the sea I’m always stopped by a stone building where the roof was blown clear off. There are still some furnishings in the room. Many parts of the town and some of the wall were damaged during World War II by the Nazis who occupied the island. It’s hard as an outsider to say when the city really modernized. Some buildings were probably used well past their date of building, even as apartments were built up around them. Every time I go running on the wall, I notice something different. There are still homes built entirely of wood. Of course now they’re shambles. Some have been a trash heap for who knows how long. The city has had occupation after occupation, the accidental explosion of gunpowder and likewise, the unpredictable earthquake. There’s something unnatural about the wall, but it is an urban landscape. When I reach the sea, before I cut east, I look to the hills and bay of Ammoudara in the west where I first lived when I arrived. The pyramid shaped hill of sacred Stroumboulas, and the power plant below it. Along the water I can only guess at what I’m smelling. Fish, of course, and the briny smell where sea meets dock. The smell of chum and rotting sea dross, of life collected and failing on rocks. Nevermind what didn’t work out — the sight of the sea never makes my heart stop beating. Even on the hardest days, I’ll head for the sea near sunset. A few of the cafes offer a decent raki, the local pumice-brandy carefully double-distilled from grape mash. At an inconspicuous diner in Ammoudara, the owner brought me a carafe of raki he made himself. He said it takes about 3 hours to distill — so much faster than I imagined. He said he also makes wine, and brought me a glass from the same vintage that produced the raki I was drinking. To enjoy them side-by-side. Such are the memories I pass over when I jog, when the landscape is always behind and the reflection a little late. But I don’t always take this route. Other times when I reach the wall I go east. Beneath the wall is a ditch — massive, moat-like — built by the Venetians to keep the Ottomans out. Now it is a garden of eucalyptus trees, some the sun-charred local orchids and black laurels. Greenery literally spills over the walls in both directions, as though nature couldn’t be kept in nor kept out. As you go east the park is less defined and the wall becomes fully assimilated to the curve of the road. The modern city and its border are indistinguishable as soon as you reach Liberty Square. It’s an ambiguous name for a square that I haven’t fully parsed. It is Liberty Square in the sense it’s a monument to the Crete’s freedom won, and autonomy from the Ottoman empire. It also has a statue of the man who helped make this happen — Eleftherios Venizelos. Eleftherios means freedom, liberty. A double entendre that I genuinely don’t know if I am enjoying by myself or with everyone. But again — that’s how I jog. With either path I take, they typically meet at the Venetian port. A stumpy stone bridge to a stumpy stone castle, two stories tall. In 1630 there were eighteen cannons on the the ground floor, and 25 cannons on the top floor. As silly as it looks, the holes and breaks and openings where warfare stuck out its neck quiets me. But not for long. The port is where everything starts. The ancient name of the city, Heraklion, was reclaimed after Crete’s freedom. Its literally meaning is Heracles’ port. For centuries this main road is where it all took place. Leading up the exact center of the city. The road goes wide and narrow and juts into courtyards for churches and old Venetian halls turned into modern municipal buildings. During Carnival the scene was filled with confetti and string and parts of missing costumes. I went jogging through this too, uphill past my favorite grills and cocktail lounges. The Venetian fountain with the lion statuary. In the evening, this pedestrian road is the great meeting place. Greek teenagers run with each other unaccompanied, while their parents and grandparents sip coffees or cocktails til late in the night. The stone streets can be slippery in the rain. Going up the main road the streets split in every which way. I almost always go toward is Kornarou Square. It’s a small plaza that pays tribute to Crete’s chivalric literary history. Vikentios Kornaros wrote the tale of Erotokritos and Aretousa and while the Cretans know their names and that the two fell in love — the story and its weight have lessened. I pass their statue and near again that great dividing wall. Like I said, it’s a small town. It’s only been three miles and I feel like I’ve seen so much. But on the inside curve of the wall, a splinter-thin road juts out and up. The road becomes the wall. 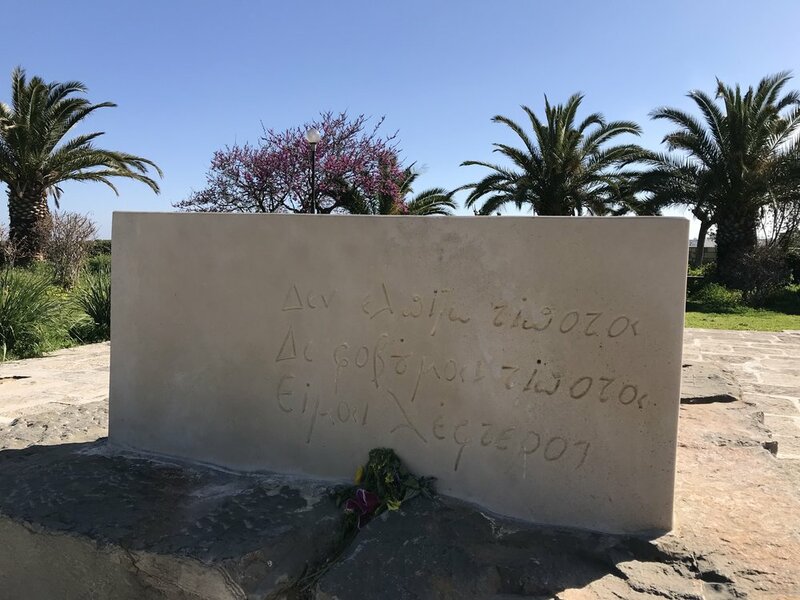 As though there were a pyramid razed of its top — the bastion is now the gravesite of the other local saint, the novelist Nikos Kazantzakis. In the south west is Mount Psioliritis, filled with snow in every dome and depression. Directly south is mount Yiouchtas, whose ridges resemble a face in profile — the forehead, eyebrows, pointed nose, lips. It’s unmistakable. Myth claimed it as Zeus’ face. I look to the sea again. The Cathedral of St Menas visible above the apartment buildings in the near distance. And the bells begin. Gong. Freedom. Gong. Death. Gong. Freedom. Gong.